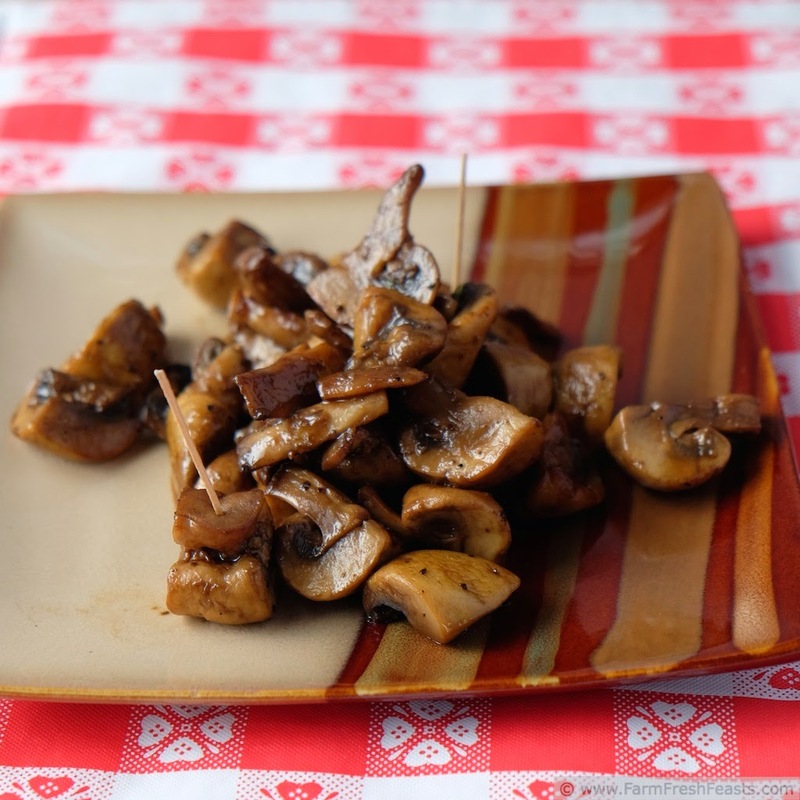 Mushrooms simply seasoned then grilled--followed by your choice of seasonings to jazz up the flavor. Simple, easy, keeps the house cool in summertime. I'm very fortunate that some committed folks made a weekly Farmer's Market happen in my little city. I can't say I used it much last year--having my hands full with the Community Supported Agriculture (CSA) farm share and all--but I did enjoy the visits I made. Since my spouse hadn't seen it, we did a recce [that would be a reconnaissance mission, it's pronounced wreck-ee if you'd like to co-opt this jargon for yourself] the other week to check out the new and improved sophomore year offerings. I picked up some eggs, some blueberries, and then I spied the man selling mushrooms. Woot! Now I know where I can go for local mushrooms! Once I get into the groove with the farm share I will partake, because we love our 'shrooms. Mushrooms = at home date night to me. What can I say? I'm easy to please. My spouse and I both love mushrooms and our kids don't, so anytime I'm making a mushroom side dish or appetizer it's guaranteed to be a date night treat. So far on this blog I've shared mushroom appetizers that are sautéed [my Skillet Mushroom Dip for Two] and roasted [my Soy Sriracha Roasted Mushrooms]. Since the kitchen is heating up by virtue to the east-facing 86 yr old windows [and without my turning on the stove or oven] I figured it was time to get my grill on. To do that, I bring out my new BGF (Best Grill Friend)--the Full Metal Basket. I'm purposely not doing an Amazon affiliate link here because 1) the whole affiliate thing seems utterly pointless and 2) I don't know what brand this could be. This new-to-me basket is large--9 inches square at the base, flaring out as it rises up 3½ inch sides to an upper opening of a square foot. 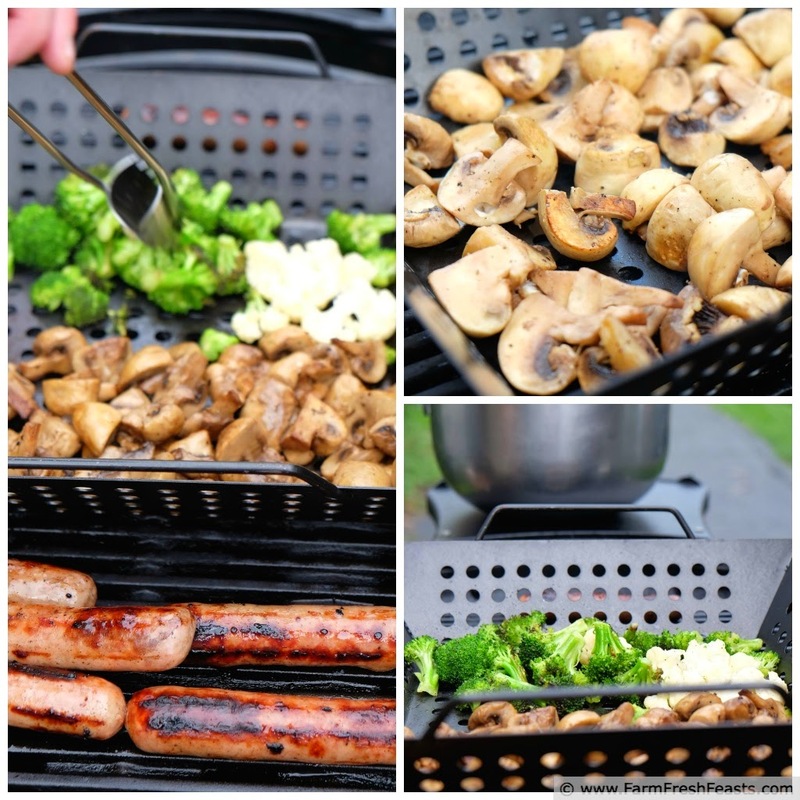 It's perfect for grilling vegetables such as peppers, onions, broccoli, cauliflower, squash, turnips, kohlrabi, beets and mushrooms. I can stir in it without everything flying out [if you've ever seen my stovetop you'd understand]. Since I picked it up at the thrift shop a few months ago I've used it each time we grill. That's a darn useful tool! These are clearly not local mushrooms. I made this recipe in May and the Farmer's Market opened up in June. Preheat grill and grill basket to medium high. 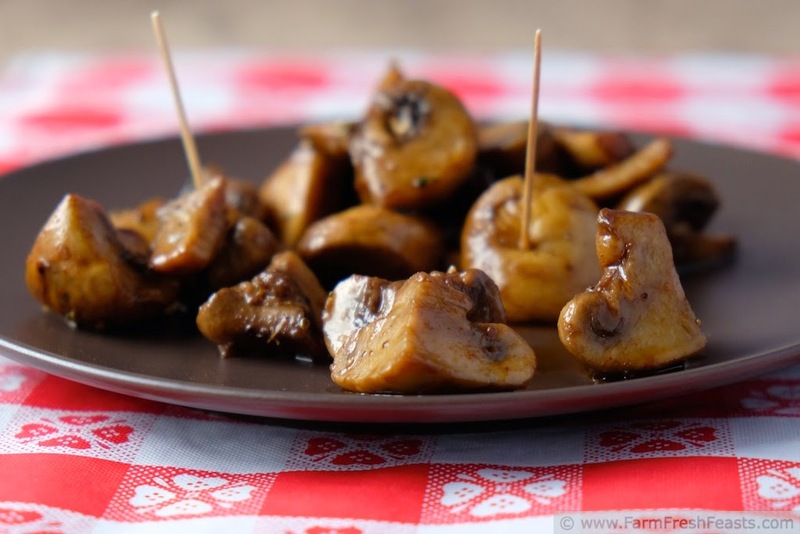 In a large bowl toss mushrooms with olive oil, then bounce them into the preheated basket. Grill, undisturbed, for 5 minutes then stir. Continue stirring every 5 minutes until mushrooms are softened and have given up their juice. Browned edges along the side are nice as well. This took about 15 minutes on our grill. 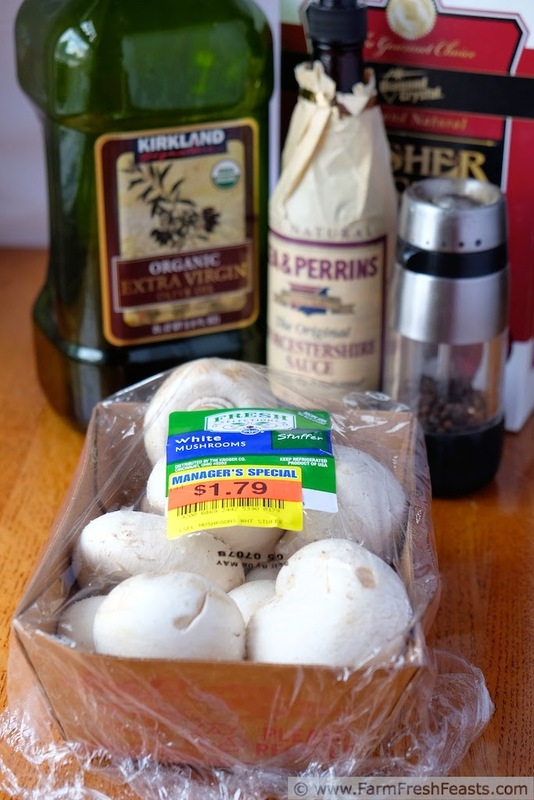 Return mushrooms to bowl and toss with Worcestershire sauce or vinaigrette (or both), taste, and add salt and pepper to your liking. Serve warm or at room temperature. These are a tasty starter and also delicious alongside grilled meats. What's your favorite grill tool? 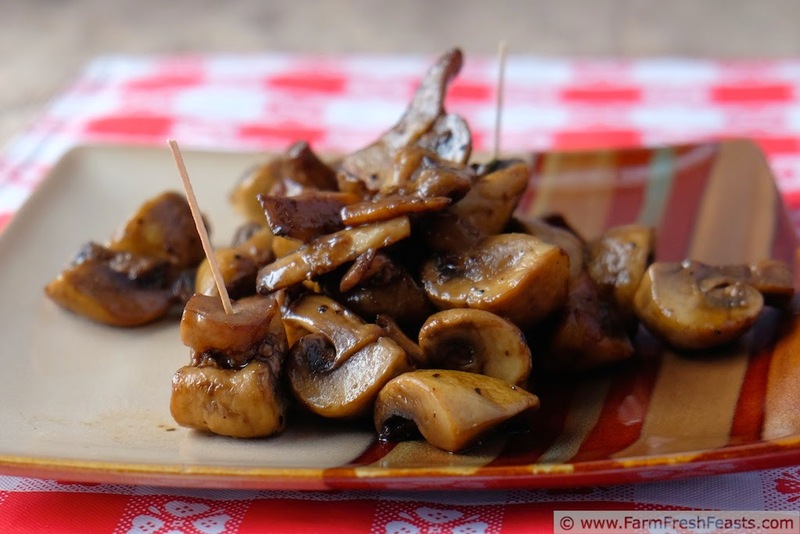 Mushrooms are yummy in so many ways. Thanks! It would probably freak out the shroom guy if I went up and called him my shroom guy right off the bat, right? Must be more circumspect, at least initially. 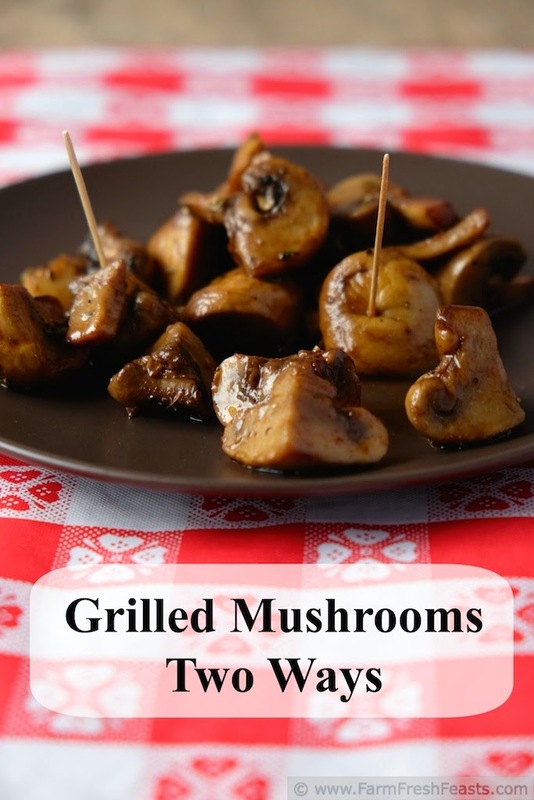 I'm the only person in my house who could (and would) eat a whole plate of grilled mushrooms, and call it a meal. So if you're ever stuck for company on date night, give me a call!